Governor Malloy’s press conference on Wednesday in which he called for tolls, a raise in the gas tax and a tire tax — and the concomitant out-pouring of support from the heady, “right-minded” and “reasonable” Connecticut intelligentsia — looks like a sham with the Connecticut commuter playing the sucker. It’s really quite simple — so the thinking goes — install congestion tolls along Connecticut highways, raise the gas tax, institute a tire tax and suddenly watch the state flourish with new infrastructure. If it weren’t for Connecticut’s infrastructure problems, the state would be a bastion of economic growth. It had all the makings of snake-oil-salesman-come-to-town, but instead of fabulous elixirs sold in colorful bottles, it is Infrastructure! — fabulous roads and bridges, buses and trains! — never mind that every one of those services survive on state subsidies paid for by taxpayers. 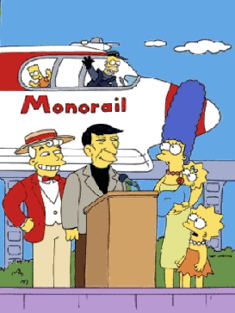 There is a classic episode of The Simpsons in which a fast-talking salesman gets the town of Springfield to use their extra money to build a monorail because it will “put them on the map.” The townspeople all jump on board with the idea and naturally it ends in disaster. Connecticut wants to be “on the map,” too. Tired of seeing explosive growth in other states, while lagging behind economically; jealous of cities like Boston and Raleigh, which continue to bloom into ever-larger economic hubs and constantly wondering why its state coffers are empty while other states appear flush, the governor and many in the legislature believe they have found the key to future prosperity — Infrastructure! And to attain that much-needed infrastructure, those same politicians get to do what they love most — collect more money with assurances to the public that this time it will be different. This time, it will work. Sure, Connecticut has made some questionable infrastructure investments in the past. The $1 billion Hartford to Springfield train will probably be perfect for dropping Hartford residents off at the brand new, sparkling casino being erected in Springfield, Massachusetts, but otherwise will probably be of little use. There’s CTFastrak, which will be helpful for getting New Britain Mayor Erin Stewart to and from the Capitol if she decides to run for governor, but she would probably be the only one riding it. There’s even a bridge over I-84 that remains unfinished, covered with weeds and “Keep Out” signs. It’s like having a small ghost-town hovering over an interstate which may soon be flush with electronic tolls to pay for more Infrastructure! Commuters can gaze upon it as their EZ Pass racks up another buck or two during the rush-hour commute. And what about rush-hour commutes? Congestion tolling supposedly lowers traffic congestion, but people still have to get to work on time. Getting to work on time is the whole reason rush hours exist in the first place. Those states and major metropolitan areas which have tolling have horrendous traffic — Washington D.C., New York City, New Jersey. Traffic remains awful, but the at least the money is coming in. And that’s part of the problem. Tolls would flood the Connecticut government with the peoples’ money, the same government which has shown repeatedly that it can’t control its spending habits or find the backbone to make serious reforms even when it’s broke. There is little reason to think that if Connecticut is suddenly raking in billions with new tolls and gasoline taxes it will become wise and frugal, focusing on infrastructure projects that will actually make a difference for the people living here. Instead, it will give legislators a billion reasons to once again throw the peoples’ money at every pet project and every union perk that lands on their desk. Who knows? Given the opportunity, in the future, they just may try to build a monorail. But at least the monorail would be Infrastructure! Connecticut’s income tax was also supposed to solve the state’s ills; it also flooded the government with cash and twenty-six years later — like the monorail in the fictional Springfield — Connecticut teeters on the brink of financial disaster.